John Brittingham is better known as "Big John" - mostly for his height; he is well over six feet tall. He is a New Mexico rancher and an acclaimed soaring pilot. About his first cross-country flight which was in a 1-26. The out part was OK but the return? The return tow is flown by an inexperienced tow pilot flying his Comanche in advance of a fast moving front. They discuss tow speeds but, nevertheless, soon they were towing at 90 mph with John holding heavy forward stick. It starts getting dark and John does not know where he is. About then the Comanche pilot asks, "Where are we?" Fortunately, a lighted field shows up; John could not see his instruments but the landing was successful. 1-26s are nice that way. John was always easily identifiable at National and International competitions due to his grubby hat - a battered, vented, discolored and thoroughly disreputable-looking Stetson that is now in the NSM. He was in charge of the team party during the 1965 Internationals in England although not an official part of the Team. He took the opportunity to introduce the Russians to the right way to drink Jack Daniels straight and chew tobacco. A special task was obtaining ice for the drinks. After 2 AM the three Russians and Big John were sitting on the floor singing. John Brittingham started flying sailplanes in the summer of 1961, earning his "C" badge #2781 in a 2-22C. He then bought a Schweizer 1-26 and started going for his badges. He earned his Diamond altitude at Colorado Springs flying the 1-26 for a gain of 19,200 feet. In 1964 he competed his Silver badge #817 and his Gold badge #186 with a 201 mile flight in his 1-26. Over the years, he has won much recognition from the 1-26 Association for his 1-26 soaring. Meanwhile he was also flying contests with his 1-26 - his first one being the McCook Nationals in 1964. He also flew the 1-26 Nationals which he won in 1967 and 1968. He wanted a higher performance sailplane. Thus, in 1965, he purchased the 15/17 convertible Dart. On May 3, 1966 he made a 322 mile flight from Colorado Springs to complete his Diamond badge (#58; Intl #484). He sold the Dart in 1967 and purchased a Standard Cirrus. He flew at least eleven National competitions, placing as high as third place twice. He also flew Regionals winning at least twice. 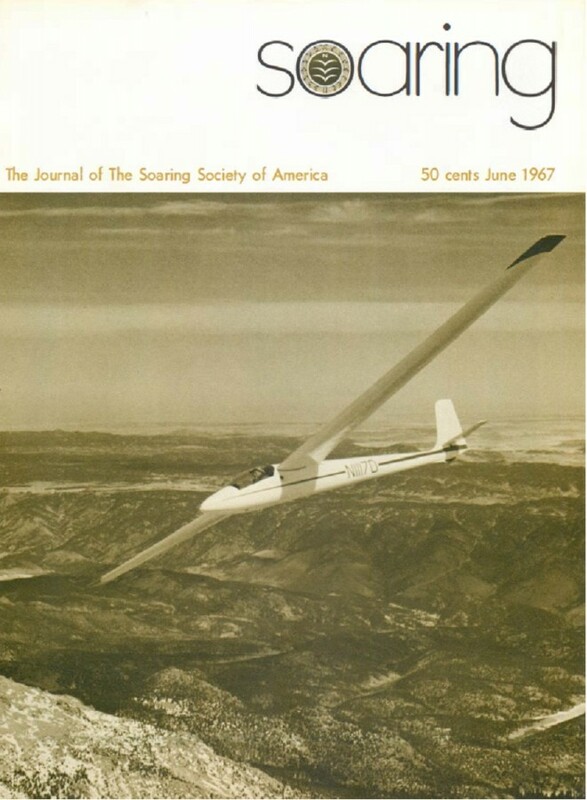 John Brittingham in his sailplane was featured on two covers of Soaring magazine - both photos taken by the very special sailplane photographer Sandor "Alex" Aldott. John Brittingham wheels his Dart 17R, (17 Meter retractable wheel) through the high Colorado air in the vicinity of Pikes Peak. 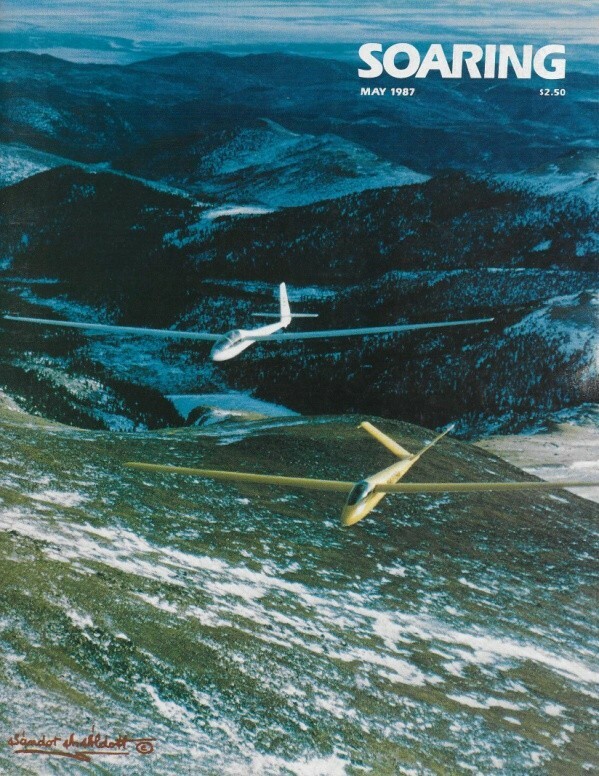 John Brittingham flying his Cirrus and Howard Taylor flying his Austria SH in formation over Pikes Peak. As the above demonstrates, John Brittingham had a passion for competition. However, this enthusiasm also extended to helping other people compete. 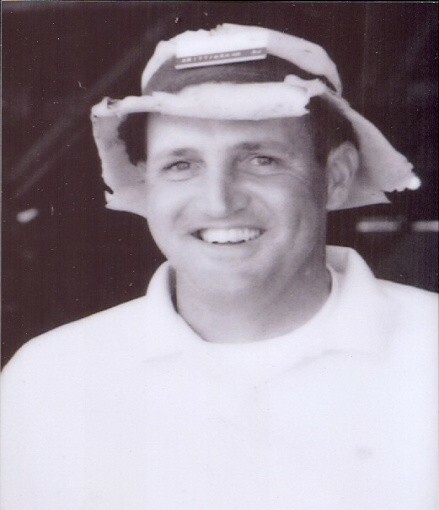 John was competition director for several 1-26 Nationals, one of which was at the Air Force Academy. He performed the same duties for National and World competitions. "Red" Wright referred to him as being "among the best competition directors he had known." He was U.S. Team Captain in 1978 (France) and 1981 (Germany). He also assisted with the Women's Soaring Seminar when it was held at Black Forest. Additionally, he served as a Director on the SSA Board as well as the National Soaring Foundation. He received the SSA Exceptional Service Award in 1981. 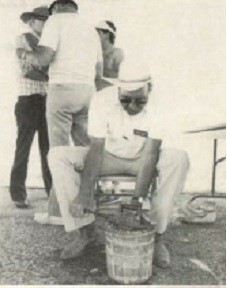 Perhaps most important of all, he knew his priorities - here he is making ice cream on a 104 F day during the World contest at Hobbs, NM in 1983.